We learn to write ourselves before we teach students to do so. We become great swimmers and then teach others to swim. We master the techniques of throwing a basketball, before we show our kids. The same is true for the creative process. Living the creative process ourselves, allows us to share it effectively with our students. Why teach the creative process? This process is a learning process and all great learners go through it. When we write anything from a short poem to a 10 page essay, we go through the creative process (otherwise know as the writing process.) When we are trying to pick just the right color to paint the walls in our bathroom, we go through a creative process (sometimes referred to as trial and error.) Day by day, we learn as we go. Life is a process. When we can help students understand the creative process as a journey for self-discovery, we are showing them something amazing as we open their eyes to how they work and learn best. Imagine if you had a group of self-aware students, ready to tackle any challenge because they knew, no matter what, they would be able to make it to the other side. Through mistakes and wrong turns, disagreements and hardships, they would be able to persevere and complete the task. WOW! What power they would hold in their hands if they knew that to be true. Why live the creative process first? Just like with anything else we want to teach others, we need to have had experienced it ourselves. When I was earning my master’s degree taking classes in the various art forms, I discovered the unique benefits of working through the creative process. In my visual arts class, I discovered how I work (spontaneously and very “go with the flow”), in dance class I discovered more about my interactions with people (hesitant at first, but will share so much with you once I get to know you), and in music class I discovered my voice (it can be as loud as a drum when I have something to say, and quiet as an egg shaker when I just want to listen). Through these creative experiences and thoughtful reflection, I was able to discover more about myself. And that is quite empowering! And I’m pretty convinced that you can’t fake the teaching of that until you have lived it. That’s why I LOVE giving hands-on creative professional development to teachers in the arts. That is the basis of The Inspired Classroom’s Summer Teacher Art Retreat. (Are YOU going???) It’s all about getting inspired by the arts, so that you can be inspiring to your students. Teach like a muse! So, now for an announcement! I’ve been anticipating this for months… and now I can finally, officially state that my new book, Studio Days in the Classroom is going to press this week! Studio Days in the Classroom is a book that shows teachers how to bring the creative process (as a learning process) into their own teaching by giving their students the opportunity to Create, Reflect and Discover! Studio Days provide students of all ages the chance to persevere in a safe, creative environment. In this book, I have provided the theory behind my concept of Studio Days as well as a complete introduction on how to get them started with your students. 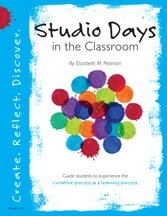 Each Studio Day lesson plan has been used in the classroom and includes both the National Arts Standards and Common Core Standards, ways to share creative work, reflection questions for students, extension ideas, and links to additional resources. Regardless of whether you teach first grade or twelfth grade, Studio Days provide unique, authentic learning experiences for your students. If you are interested in pre-purchasing your own copy of this book, please do! They will be available and in the mail by mid August. I hope you are able to do great things with your time so that you can live the creative process. It can only make you a better educator!